I know the first day of fall isn't for a few weeks yet, but I can't help it! It's definitely necessary to squeeze in as much pumpkin baking as humanly possible during the next few months. 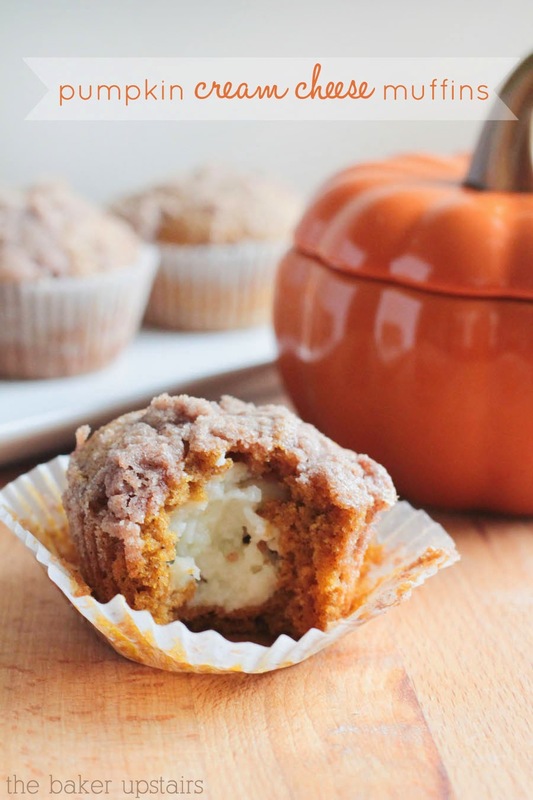 These pumpkin cream cheese muffins are so delicious and perfect for fall! I made them a few days ago and brought some in to work, and the verdict was unanimous: they are delicious! These muffins are just layer upon layer of awesomeness. 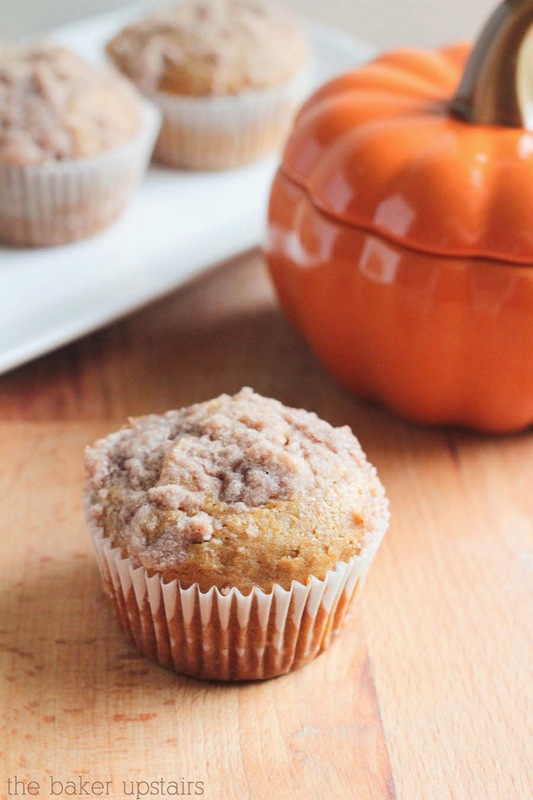 The pumpkin muffin base is lightly spiced and super moist, and so flavorful. The cream cheese filling is creamy and sweet, and tastes almost like cheesecake. And the cinnamon streusel on top adds a nice crunch and makes them over the top delicious! 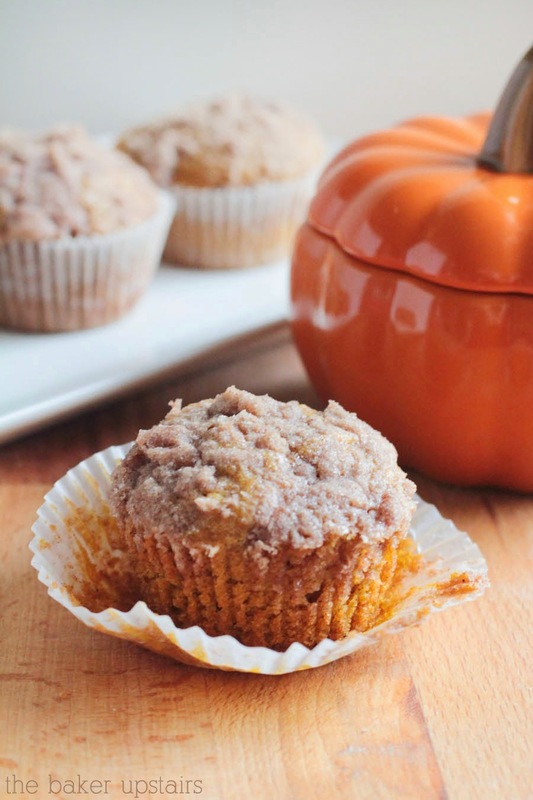 These muffins are definitely a must try this fall! Preheat the oven to 350. Line two muffin tins with paper liners. To make the filling, beat together the cream cheese and powdered sugar until well blended. Chill the filling in the freezer while you mix up the muffin batter. To make the muffins, in a medium bowl whisk together the flour, cinnamon, nutmeg, cloves, pumpkin pie spice, salt, and baking soda. In a large bowl or the bowl of a stand mixer, beat together the eggs, sugar, pumpkin, and oil until combined. Add the dry ingredients and mix until just combined. Scoop 1-2 tablespoons of muffin batter into each cup of the muffin tin. Remove the filling from the freezer and scoop teaspoon-sized spoonfuls of filling into each cup. Fill the muffin cups 3/4 full with the remaining batter, covering the cream cheese layer. To make the streusel, combine the sugar, flour, and cinnamon in a small bowl. Cut in the butter until the mixture resembles coarse crumbs. Sprinkle each muffin cup with a small amount of streusel. Bake 20-25 minutes or until the muffins spring back when touched lightly. Remove and let cool before serving. I'm getting ready to make a batch just because. Wish me luck. I really hope mine come out as good as these look.